Cut ½ kg chicken breast into slices.Marinate chicken with 1 tbsp ginger garlic paste and salt to taste for 5 – 6 minutes.Now add 4 tbsp honey, 1 tbsp soya sauce, 2 tbsp vinegar, ¼ tsp white pepper, salt to taste and ¼ tsp black pepper. Keep it aside. Cut red capsicum into small cubes, now thread chicken pieces in wooden skewers altering with capsicum cubes. 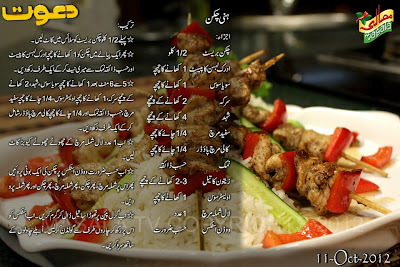 Heat oil in a grill pan, cook prepared stick from all the sides till golden brown, serve with boiled rice.